Authors: Zelenev A.V., Pleskachev Y.N., Seminchenko E.V. 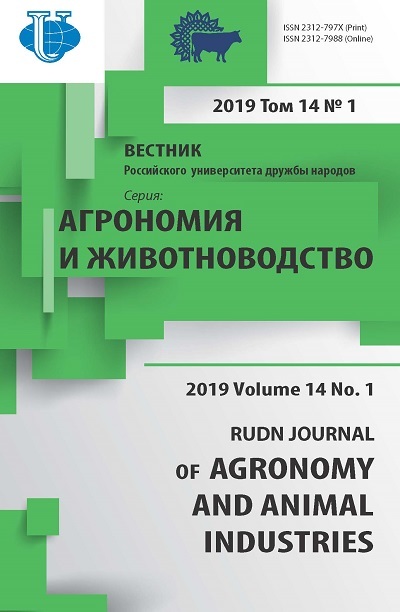 An estimation of various agro-biological methods in crop rotation of dry-steppe zone of light chestnut soils of the Lower Volga region is given. The effectiveness of a grain-fallow four-field crop rotation has been established, where green manure crop mass of winter rye, straw and leaf-weed mass of crops are plowed in soil, which increases organic matter and nutrient content in soil, reduces humus loss, and stabilizes grain yields. It was noted that only in four-field grain-fallow green manure crop rotation there is a positive balance of the main nutrients in the soil per hectare, where additional organic matter enters arable layer of soil in the form of winter rye green manure crop. In this variant, the balance was: nitrogen +39.7; phosphorus +0.7 and potassium +49.9 kg/ha. In six-field grain crop rotation with ginger as a sidereal crop, a positive balance is achieved only for phosphorus +14.1 and potassium +35.5 kg/ha, for phosphorus there is a negative balance of -3.5 kg/ha. In the eight-field grain crop rotation with 50% of legume crops, a positive balance is achieved only for potassium, +29.8 kg/ha. The balance of humus can be regulated by the structure of areas, alternation of crops in field crop rotations, application of plant residues in the form of sidereal crops, straw, leaf-weed mass, decrease in the proportion of fallow and tilled crops in the structure of biotivated crop rotations. The most complete biologization is possible in green manure crops, where humus losses decrease 1.5 times or more. A positive balance of organic matter is ensured in four-field biologized grain-fallow crop rotation - +3.33 t/ha. biologization, field crop rotation, light chestnut soil, organic matter, green manure crop, humus. INTRODUCTION To improve efficiency of agriculture in the Lower Volga region, it is necessary to develop and introduce field biological crop rotations and resource-saving cultivation methods of grain crops. The biologization of agriculture assumes introduction of green manure fallows, leguminous and intermediate crops in crop rotation for green fertilizing, application of straw and leafy mass of crops into soil. Therefore, complex study of agro-biological methods in field crop rotations using bioresources capable of restoring natural balance and soil fertility and increasing yield of grain produce per hectare of arable land has particular relevance and novelty [1-4]. MATERIALS AND METHODS The studies were carried out on experimental field of Nizhnevolzhsky Research Institute of Agriculture. The soil of the experimental plot is light chestnut heavy loam with 1.74% humus content in top soil, pH 8.1. Content of easily hydrolyzable nitrogen is 2-7 mg/100 g soil, mobile phosphorus is 3-11 mg/100 g and exchangeable potassium is 30-40 mg/100 g soil. Replication was four-fold. The area of the experimental plot was 200 m2. Precipitation in 2013-2014; 2014-2015, 2015-2016 and 2016-2017 research years was 435.5 mm; 266.8 mm; 554.8 mm and 374.9 mm, respectively, compared to average annual value of 339.7 mm. Winter wheat ‘Kamyshanka 5’, oat ‘Golozerny’, sorghum ‘Kamyshinskoe 31’, pea ‘Aksaysky usaty 10’, chick pea ‘Privo 1’, safflower ‘Aleksandrit’, camelina ‘Yubilyar’, winter rye ‘Saratovskaya 7’. The effectiveness of biologization was studied in field crop rotations: 1) Grain-fallow four-field: black fallow - winter wheat - sorghum for grain - oats (control); 2) Grain-fallow green manure four-field: green manure fallow (winter rye) - winter wheat - sorghum for grain - oats; 3) Grain-fallow green manure six-field: green manure fallow (camelina) - winter wheat - sorghum for grain - chickpeas - safflower - oats; 4) Grain eight-field: peas - winter wheat - chickpeas - safflowers - peas - sorghum for grain - chickpea - oats. In the first control crop rotation straw of winter wheat and oats, leaf sorghum mass was removed from the field. In the second, third and fourth crop rotations leaf mass of crops remained in the field was plowed in the soil with a heavy disc harrow. The main soil cultivation method in all variants was deep chiseling at 0.30...0.32 m with a surface layer rotation to a depth of 0.20...0.22 m. It was carried out using OCHO-5-40 tool with multifunctional working bodies of the modular type “RANCHO” (blade and a wide chisel). Before discing of winter wheat and oats straw, leafy mass of sorghum and safflower, ammonium nitrate was added in the calculation of 10 kg of active ingredient per 1 ton. Green manure crops - winter rye and camelina were sown in spring because of unfavorable autumn conditions. For this reason, in 2015 and 2016, instead of winter wheat, spring wheat ‘Kamyshinskaya 3’ was sown. The rest crops were sown on time in established optimal terms. RESULTS AND DISCUSSION The circle of organic matter in crop rotations makes it possible to estimate possible loss of soil fertility due to removing of plant residues of cultivated crops from the field [5, 6]. Great importance in supply of organic matter to soil in crop rotations belongs to green manure crops, which compensate loss of organic matter due to humification of green and root mass entering the soil (Table 1). Table 1 Circulation of organic matter in biologized crop rotations, t/ha of crop rotation area (average for 2014-2017) Variant Crop rotation Accumulated Removed Applied Balance 1 (control) Grain-fallow four field 5.43 4.31 1.12 -3.19 2 Grain-fallow green manure four-field 7.13 1.90 5.23 +3.33 3 Grain-fallow green manure six-field 5.92 1.75 4.17 +2.42 4 Grain eight-field 5.64 1.84 3.80 +1.96 Table 1 shows that in biologized crop rotations more organic matter returns to soil, and all of them exceed control. Applied organic matter in grain-fallow green manure four- and six-field rotations is higher by 4.11 and 3.05 t/ha respectively, grain eight-field crop rotation - by 2.68 t/ha. A positive balance of organic matter is ensured in these crop rotations. The highest value is observed in four-field biologized grain-fallow crop rotation +3.33 t/ha, the lowest in eight-field grain-cropped rotation +1.96 t/ha. In six-field grain-fallow green manure crop rotation +2.42 t/ha. Removal of basic nutrients from soil by field crop yields has reached critical values recently . Therefore, it is very important to return them annually to soil with organic matter of cultivated crops in form of straw and leaf mass (Table 2). Table 2 Circulation of basic nutrients in top soil applied with organic matter of field crops in biologized crop rotations, kg/ha of crop rotation area (average for 2014-2017) Variant Accumulated Removed Applied Applied with ammonium nitrate Balance N P2O5 K2O N P2O5 K2O N P2O5 K2O N P2O5 K2O N P2O5 K2O 1 (control) 66.7 15.1 45.0 59.2 13.0 36.5 7.5 2.1 8.5 7.5 2.1 8.5 -51.7 -10.8 -28.0 2 97.8 23.9 63.9 43.7 11.6 7.0 54.1 12.3 56.9 83.4 12.3 56.9 +39.7 +0.7 +49.9 3 80.0 17.9 49.5 46.1 10.7 7.0 33.9 7.2 42.5 60.2 7.2 42.5 +14.1 -3.5 +35.5 4 85.4 17.1 45.6 55.9 11.6 7.9 29.5 5.5 37.7 49.4 5.5 37.7 -6.5 -6.1 +29.8 Table 2 shows that four-field grain-fallow green manure crop rotation is the only crop rotation which has positive balance of basic nutrients in soil per ha of crop rotation area, where in addition to straw and leafy mass of cultivated crops organic matter in form of winter rye green manure crop is additionally supplied to top soil. In this variant the balance was: nitrogen +39.7; phosphorus +0.7 and potassium +49.9 kg/ha. In six-field grain-fallow biologized crop rotation with camelina green manure, a positive balance was achieved only for phosphorus +14.1 and potassium +35.5 kg/ha, for phosphorus there was a negative balance -3.5 kg/ha. In eight-field grain crop rotation with 50% of leguminous crops, a positive balance was achieved only for potassium +29.8 kg/ha. For nitrogen and phosphorus, this rotation showed a negative balance of -6.5 and -6.1 kg/ha, respectively. The negative nitrogen balance in this variant is due to the fact that straw of leguminous crops before its plowing was not applied with ammonium nitrate, which apparently should be done, as share of legumes in structure of crop rotation is 50%. Also, when sowing crops in biologized crop rotations, it is necessary to add phosphorus fertilizer in form of superphosphate due to negative balance of this element, especially in six- and eight-field crop rotations. In the control variant, where all straw and leafy mass of field crops is removed from the field, a negative balance of nitrogen, phosphorus and potassium is provided: -51.7; -10.8 and -28.0 kg/ha of crop rotation area, respectively. Humus balance can be regulated by structure of areas, alternation of crops in field crop rotations, application of plant residues in form of green manure, straw, leafy mass, reduction in proportion of black fallow and tilled crops in biologized crop rotations. The most complete biologization is possible in crop rotations, where losses of humus decrease 1.5 times or more. Short-term cereal rotations adopted in the Lower Volga region contribute to uncompensated and significant humus losses, which reach 500-700 kg/year/ha of arable land. The most accessible measure to reduce humus deficiency is application of straw and leafy mass of field crops (average of 2.5...3.0 t/ha), which reduces annual deficit in three-, four-field grain-fallow crop rotations by about 50-100 kg [8, 11]. Increased losses of organic matter intensified processes of reducing soil fertility (Table 3). Table 3 Humus balance in field biologized crop rotations, t/ha (average for 2014-2017) Variant Crop rotation Humus balance Mineralization Humification Balance 1 (control) Grain-fallow four-field 0.76 0.15 -0.61 2 Grain-fallow green manure four-field 0.48 0.66 +0.18 3 Grain-fallow green manure six-field 0.46 0.45 -0.01 4 Grain eight-field 0.53 0.40 -0.13 Table 3 shows that four-field grain-fallow control rotation with black fallow has the highest (0.76 t/ha) mineralization degree of organic matter, which is higher by 58.3, 65.2 and 43.4% compared to four-, six- and eight-field rotations, respectively. The highest humification of organic matter is ensured in four-field grain-fallow crop rotation with green manure - 0.66 t/ha, which is 0.51 t/ha higher compared to the control. Six- and eight-field crop rotations exceed the control in humification of organic matter by 0.30 and 0.25 t/ha, respectively. Favorable positive balance of humus (+0.18 t/ha) is formed in four-field grain-fallow crop rotation with winter rye green manure. In other variants a negative balance of humus is observed: -0.61 t/ha in the control, -0.01 t/ha in six-field and -0.13 t/ha in eight-field rotation. In the Lower Volga region, the greatest grain yield is provided in four-field grain-fallow and grain-fallow-cropped rotations, including various groups of field crops with different vegetation season, which are more resistant to unfavorable weather conditions. This allows observing principle of technological diversity, which reduces negative changes in agroecosystems under unilateral anthropogenic influence [9, 10]. To estimate crop rotation, yield of grain from one hectare of arable land was calculated (Table 4). Table 4 Grain yield in field biologized crop rotations, t/ha of crop rotation area (average for 2014-2017) Variant Crop rotation 2014 2015 2016 2017 Average 1 (control) Grain-fallow four-field 1.53 1.25 2.40 1.96 1.79 2 Grain-fallow green manure four-field 1.63 1.25 2.73 1.99 1.90 3 Grain-fallow green manure six-field 1.17 1.29 2.64 1.92 1.75 4 Grain eight-field 0.88 1.65 2.95 1.90 1.84 LSD05 0.04 0.05 0.05 0.08 - Table 4 shows that the largest yield of grain from one ha of crop rotation was achieved in 2016, in other years it was similar. This indicator is the highest in four-field grain green manure crop rotation with winter rye green manure - 1.90 t/ha, which exceeds the control by 0.11 t/ha or 6.1%. In eight-field grain biologized crop rotation (without black fallow but with 50% of legumes) grain yield is 1.84 t/ha, which is 0.05 t/ha or 2.8% higher than the control variant. Six-field grain green manure crop rotation with camelina green manure is at the same level of grain per hectare of crop rotation area with control and is 1.75 t/ha. CONCLUSIONS The highest positive balance of organic matter is ensured in four-field biologized grain-fallow crop rotation (+3.33 t/ha), the lowest one is in eight-field grain crop rotation (+1.96 t/ha). A positive balance of nutrient elements is ensured only in four-field grain-fallow crop rotation, where in addition to straw and leaf-weed crops, additional organic matter enters the arable soil layer in the form of winter rye green manure crop. Here the balance was +39.7; phosphorus +0.7 and potassium +49.9 kg/ha. In six-field grain-fallow crop rotation with camelina green manure, a negative balance was achieved only for phosphorus -3.5 kg/ha. In eight-field grain with 50% leguminous crops nitrogen and phosphorus have negative balances of -6.5 and -6.1 kg/ha, respectively. Therefore, it is necessary to apply phosphorus fertilizer in form of superphosphate when planting in rows, and in eight-field crop rotation ammonium nitrate should be added to straw of legumes. Four-field grain-fallow crop rotation with winter rye green manure has a positive effect on improvement of soil fertility, where the most favorable humus balance is +0.18 t/ha. A negative balance of humus was observed in the control variant (-0.61 t/ha), six-field (-0.01 t/ha) and eight-field biologized crop rotations (-0.13 t/ha). The use of effective resource-saving methods of cultivating field crops using renewable bioresources (straw, leaf, stubble and root residues, green manure crops) provides an increase in productivity of arable land in four- and eight-field crop rotations by 6.1 and 2.8%, respectively. Belenkov AI, Gorbunova IF. Soil fertility: modern concept of justification and solution of the problem. Zernovoe khozyaistvo. 2006;(3):25. (In Russ). Loshakov VG. Effectiveness of separate and combined use of crop rotation and fertilizers. Achievements of Science and Technology of AIC. 2016;30(1):9-13. (In Russ). Mudrykh NM, Samofalova IA. Use of plant residues in soils of Non-chernozem zone of Russia (review). 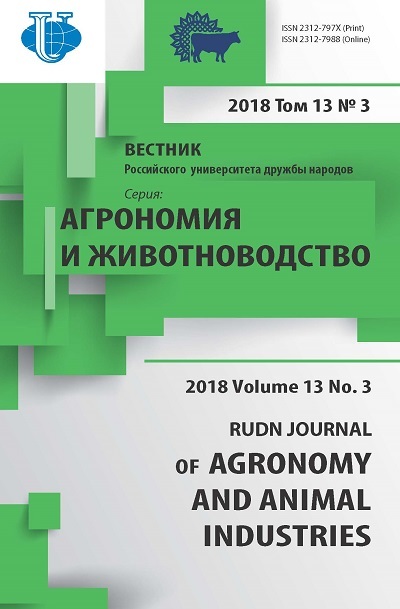 Perm Agrarian Journal. 2017;17(1):88-97. (In Russ). Perekrestov NV. Soil and climatic resources of the Volga-Don interfluve. Vestnik Prikaspiya. 2013;(2):40-47. (In Russ). Zelenev AV, Seminchenko EV. Efficiency of biologization in field crop rotations of dry steppe zone on light-chestnut soils of Lower Volga region. Sovremennoe ekologicheskoe sostoyanie prirodnoi sredy i nauchno-prakticheskie aspekty ratsional'nogo prirodopol'zovaniya: materialy II Mezhdunarodnoi nauchno-prakticheskoi Internet-konferentsii. Razdel Zemledelie, agrokhimiya i zashchita rastenii. Solenoe Zaimishche: PNIIAZ Publ. ; 2017. P. 858-862. (In Russ). Kulikova AH. Differentiation of crop rotation by effect on soil organic matter regime. Vestnik of Ulyanovsk state agricultural academy. 2011;(2):27-33. (In Russ). Novikov AA, Kisarov ОP. Substantiation of role of root and stubble residues in agro-ecosystems. Scientific Journal of KubSAU. 2012;78(4):643-652. (In Russ). Shramko NV, Vikhoreva GV. Influence of biological function and fertilizers application methods on humus-power indicators of sod-podzolic soils of the Upper Volga region. Agrarnyi vestnik Verkhnevolzh'ya. 2016;14(2):13-19. (In Russ). Persikova TF, Cуganow AR. Agroekologiczhe aspektу zastosowania nawozov komlekowуch wogniwie zmianowania jeoznien + koniczyna. Folia Univ. agr. Stetin. Agr. 1998;72:261-263. (In Polish). Kozlova LM, Makarova TS, Popov FA, Denisova AV. Crop rotation as a biological method of preserving soil fertility and increasing productivity of arable land. Achievements of Science and Technology of AIC. 2011;(1):16-18. (In Russ). Postnikov PA. Productivity of crop rotations when using biologization methods. Agrarnyj vestnik Urala. 2015;136(6):20-23. (In Russ). Copyright (c) 2018 Zelenev A.V., Pleskachev Y.N., Seminchenko E.V.